In New York State and in many places around the nation, there are not enough skilled workers to meet the needs of today’s workplaces. And the need for skilled workers keeps growing. Chart from report. ReadyNation/America’s Edge. When we think about jobs with different skill levels, we may think of white collar jobs or blue collar jobs. But a substantial and growing segment of jobs are middle skill jobs — those that require more than high school but less than a four-year college degree. In New York, these middle-skill jobs comprise 33 percent of all jobs in the state. A new report released today by ReadyNation/America’s Edge shows that New York is projected to face a deficit of 350,000 middle-skill workers needed to fill jobs in the state. By 2020, 81 percent of the high-growth, high-wage jobs in the state will require at least a two-year degree. 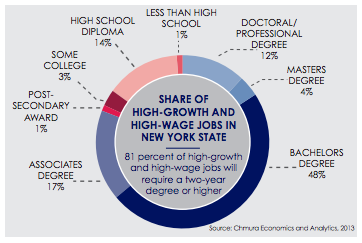 And in STEM fields, 95 percent of jobs in New York will require education beyond high school. What can New York citizens and policy makers do to address the growing demand for skilled workers? The report calls for innovative high school education approaches, along with rigorous Common Core Learning Standards, to help prepare tomorrow’s workforce and help close these skills gaps. These education models each promote a set of cross-cutting skills referred to as 21st century learning skills, which include: critical thinking, problem solving, working collaboratively, and communicating effectively. These education models, such as Career Academies, Big Picture Learning, and the New Tech Network, prepare students for college and career success. The press release of the report.